The mysterious chef behind PornBurger has a long history of experimenting with burger buns. When he's not coating them in potato chips, he's ditching them for rice balls, donuts, and even Pop-Tarts. Now, he's sandwiching burgers between straight-up fruit. 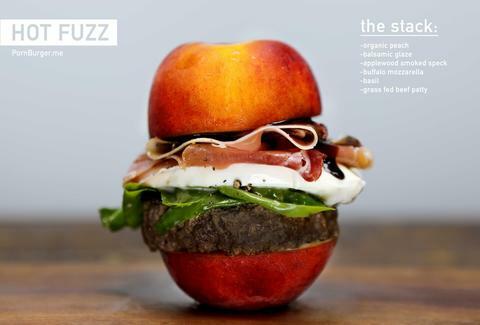 The brand new Hot Fuzz burger features a beef patty with basil, buffalo mozzarella, applewood-smoked speck, and a balsamic glaze, all on a peach "bun" that presumably came from the country, where they eat them a lot of peaches. It's the ideal snack for your Bad Boys II and Point Break marathons, or overdue visitation with the entire Cornetto Trilogy, for which it's named. Kristin Hunt is a food/drink staff writer at Thrillist. Like the Hot Fuzz dudes, she has always wanted to fire a gun in the air while yelling, "aaaargh". Follow her to other Point Break recreations at @kristin_hunt.